Bubble Bath Soap Poisoning is the accidental or intentional intake of the compound. What is Bubble Bath Soap Poisoning? 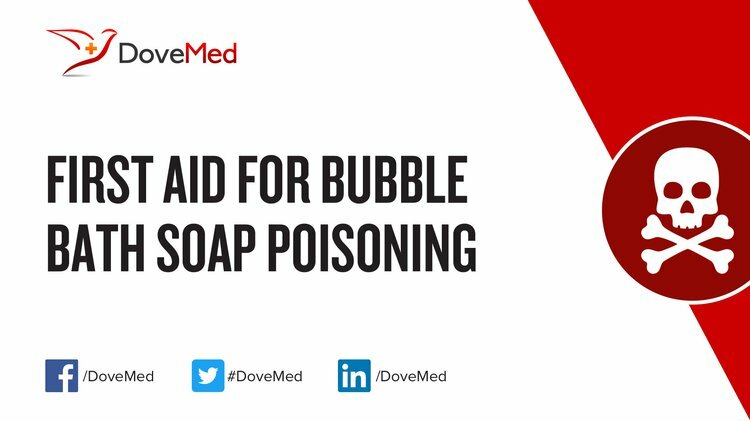 Bubble Bath Soap Poisoning may be also referred to as Bubble Bath Soap Toxicity. What are the Causes of Bubble Bath Soap Poisoning? What are the Signs and Symptoms of Bubble Bath Soap Poisoning? How is First Aid administered for Bubble Bath Soap Poisoning? Generally, Bubble Bath Soap Poisoning is a non-serious condition. With appropriate and adequate home care, the individual may recover completely, without any severe symptoms being noted. Who should administer First Aid for Bubble Bath Soap Poisoning? First aid for Bubble Bath Soap Poisoning is administered by healthcare professionals. What is the Prognosis of Bubble Bath Soap Poisoning? How can Bubble Bath Soap Poisoning be Prevented? Ruggiero, S., Moro, P. A., Davanzo, F., Capuano, A., Rossi, F., & Sautebin, L. (2012). Evaluation of cosmetic product exposures reported to the Milan Poison Control Centre, Italy from 2005 to 2010. Clinical toxicology, 50(10), 902-910. Kelly, F. (2010). Use of topical corticosteroids. Australian Pharmacist, 29(11), 938. Townsend, S. (2012). Everyday Strategies™: Autism and the Things it Teaches. Reddy, S., Reddy, S., Joshi, H., & Joshi, H. (2014). Mysore Sandal Millennium, the launch of India's most expensive soap. Emerald Emerging Markets Case Studies, 4(2), 1-11. Marfatia, Y. S., Patel, D., Menon, D. S., & Naswa, S. (2016). Genital contact allergy: A diagnosis missed. Indian journal of sexually transmitted diseases, 37(1), 1. Pruritus, V. (2013). POSTGRADUATE OBSTETRICS & GYNECOLOGY. OBSTETRICS & GYNECOLOGY, 33(7). Winnebeck, K. (2014). Clean, Green & Healthy (Doctoral dissertation, US Environmental Protection Agency).